Hellooooo friends I have been down the pub and the bloke is putting the children to bed and tomorrow I have some fantastic rhubarb-&-ginger gin cocktails recipes to share with you but for now I give you some pre-organised pony pictures. Now I have to have more gin. Yes. Byeeee. It’s been very windy here, and it seems to have been getting the shaggy ponies’ blood up. 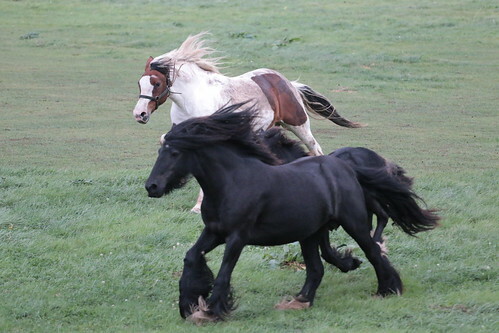 They’ve been playing tag, or possibly having races, with their horse companion. Maybe it’s the equine version of Calvinball? Three abreast: Cousin It, daughter What, and Horse. 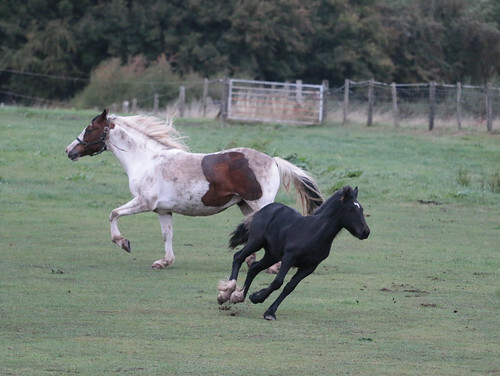 This looked like a race at first, but then What nosed Horse just before side-stepping and zooming off. This entry was originally posted at https://nanila.dreamwidth.org/1194047.html. The titration count is at .0 pKa. Haha, I had a chuckle at Calvinball. I wasn't sure how many people would remember Calvinball! Calvin & Hobbes was such a big part of my childhood. I remember pestering my grandpa for the bit of the newspaper that had the comics so I could read the latest one. Thank you. Fingers crossed for a good year; am making lots of changes in the next few months so it'll shake things up, hopefully for the better.